Reboot you machine without start up any software. Look at C0% in Main ThrottleStop window. Much over 0.5% while Idle means something is taxing your Cpu. Post results. This is what I got on a freshly booted system with startup programs and services disabled. So I was thinking this isn't normal, but I should ask anyway. Right now I'm getting an idle temp of 50-55C on my CPU and 60-70C on my GPU. That seems a bit hot, so I just wanted to get some input from you guys here to see if there's anything I can do. EDIT: GPU went down to 55C but eh. You see? Temp is lower at Idle than you stated in your previous post above. Try the same but put Speed Shift - EPP at 80. 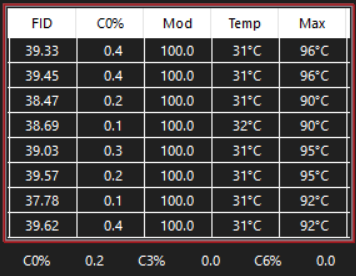 I think I had a lower temp the first time since I had my fans on max before I restarted. I did it again with the EPP at 80 and these are my temps now. This is with almost all my regular startup programs running after a couple minutes. If you run regular startup programs many of they will run in the background. As I said... Once you see C0% increase this means cpu is taxed. Higher C0% the higher Idle temp. Aka normal behaviour. This is while on the internet. Arrrrbol and raz8020 like this. If you run regular startup programs many of they will run in the background. As I said... Once you see C0% increase this means cpu is taxed. Higher C0% the higher Idle temp. From the looks of task manager, it seems Chrome and Discord use the CPU regularly, but those programs are essential so. What bothers me is that when I got the laptop I was able to get it down to 32C with the fans on max, but now I can't do that anymore. Also GPU seems too high, just for the programs I'm running. 775Tm use shared heatsink. Heat go out to the coldest place the whole time. Cpu heat can affect Gpu and as well the opposite. Idle state means no load on hardware. Do not be so caught up in idle temperature. But rather be more concerned with the temperatures under full load if you see what I mean. Turing P775TM uses shared heatsink, Pascal version (what he has) does not. Arrrrbol, FTW_260, raz8020 and 1 other person like this. You need to be aware of ambient temperatures, is the heatsink as clean as when you got it? Probably not, I've had the laptop for a year but I haven't done any maintenance on it. I also have a lot of cats. Well that's something to look into certainly.